Today's idea is a Side Spring Card. Just a few score lines and folds and you can create this cute design. I have to admit that I had trouble with the final fold at first, but there is a written tutorial and a video, so after watching the video twice, I easily finished the card up. Hope you have a chance to try this card design. Oh what a cool fold, I'm not sure that I have ever seen this type of card before, but I know I sure like yours. Fabulous Sue! 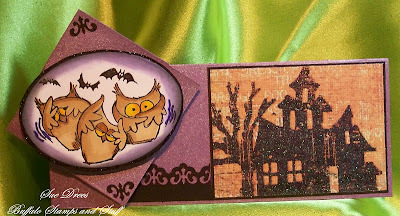 beautiful halloween card, great spring card. Really cute in a great Halloweeny way!